Whether you’re a business beginner with big ideas or an established company looking to review you plans in a changing business environment this practical, user friendly guide gives you everything you need to get started. 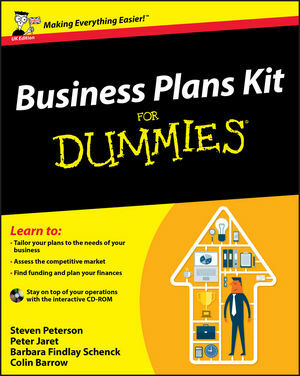 Complete with an interactive CD packed with planning templates including; planning documents, forms, financial worksheets, checklists, operation surveys and customer profiles in both Word and PDF formats you’ll be armed with all you need to kick start the planning process and create a winning business plan that suits you and your long-term business vision. New content covering online business opportunities and resources, alternative ways in to business including franchising, network marketing and buy outs, research methods and choosing suppliers and outsourcing will all be added to the UK edition. Steven Peterson is CEO of Strategic Play, a top management training company. Peter Jaret is an award-winning author and journalist. Barbara Findlay Schenck is a business and marketing consultant. Colin Barrow is a venture capitalist, entrepreneur and the best-selling author of Starting a Business For Dummies.